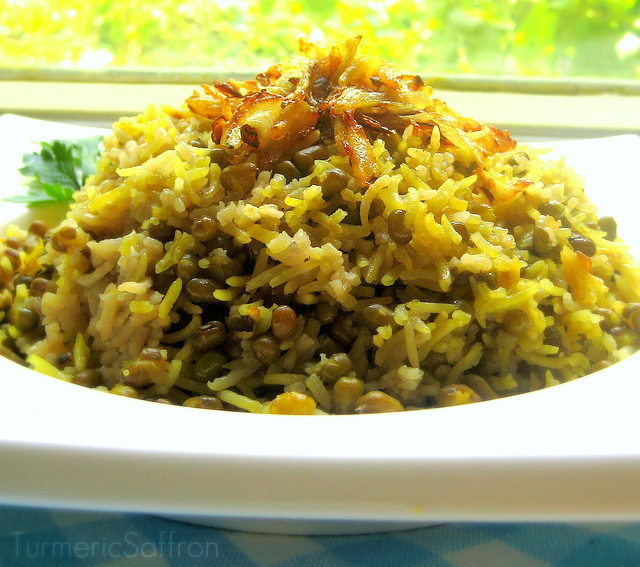 ماش پلو Maash Polow (rice with mung beans) is a delightful summer dish, light, simple and delicious. Usually, around the beginning of each summer, I go through my pantry and check the shelves for any kinds of grains, peas and beans that have been stored in jars, bags and containers and decide what to make with them so that they won't be left sitting on the shelves throughout the hot and humid summer days. That's when I found this forgotten jar of mung beans that I had bought 2-3 months ago. 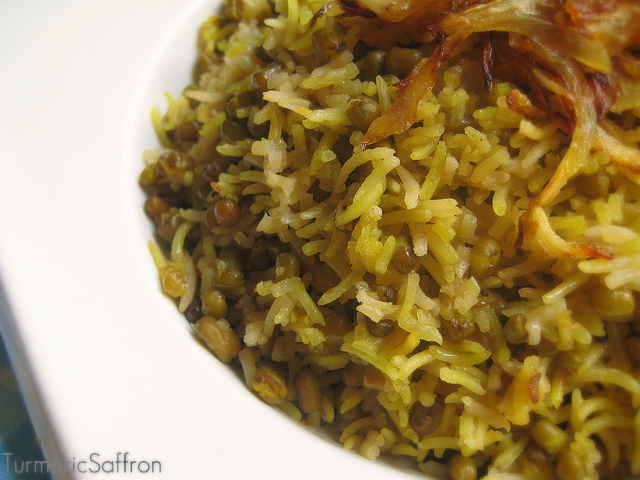 Mung beans are good in soups, salads and are super delicious when cooked with rice, sauteed onions and a heavy pinch of turmeric, slowly over low heat. I've used a different method for cooking this rice. There's no need to pre-soak the rice. This is an easier method of cooking rice and it's more flavorful. I like to use equal portions of rice and beans for this dish. If you like you can add another 1/2 cup of rice to the recipe. In a medium pot, place the beans, add 3-4 cups of water over medium heat and bring to a boil, reduce heat, cover and cook on medium to low heat for about 30-40 minutes until the beans are soft. In the meantime, in a non-stick heavy bottom pot with a tight fitting lid, heat 4 tablespoons of oil or butter and saute the chopped onions until they turn golden, add turmeric and cumin. Stir thoroughly. Add the mung beans to the onions, mix gently and cook them together for 5-7 minutes. Add the rice to the pot, add water to cover the rice by a couple of inches, add salt to taste. Bring to a boil, place a clean soft kitchen cloth between the lid and the pot to absorb the excess moisture, close the lid tightly and cook for an hour over low heat. Serve warm on a platter with plain yogurt or mast-o-khiar. I could get my late father a nice shirt, a warm vest, a fancy pipe with some tobacco or a cologne for father's day and he would have been happy but he also enjoyed a good meal followed by a sweet dessert, preferably ice cream, lots of it. Growing up, I remember him bringing home noon-ghandi (sweet bread), pashmak (cotton candy), ab-nabat (hard candy) to name a few. But ice cream had it's own special place and he could easily finish a gallon of vanilla ice cream in one sitting if he weren't trying to maintain a somewhat healthy diet due to his many health issues. However, on occasion his temptations and cravings for sweets got the best of him and he indulged in foods that weren't the best choice for him. He also liked a daily side dish of yogurt with grated cucumber and mint, yogurt with dill-weed or yogurt with dried fenugreek with his lunch. It was on one of his trips to New York that I had learned what an exceptional cook my father was. He came alone and without my mother and I got to see him in the kitchen with his sleeves rolled up, frying onions and cutting meat! An Iranian father of his generation making delicious khoresh ghaymeh. That was the culinary side of him that I don't think anybody knew about for as long as he lived. But I consider it a blessing that he stayed for several months while I was working and studying for long hours. Coming home to my father's delicious home-cooked meals was a bliss. 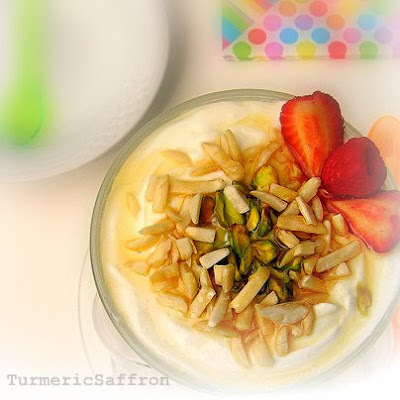 For Father's Day I'd suggest making دسرماست وعسل mast-o-asal (honey and yogurt dessert. It's a healthy dessert made with yogurt, almonds and pistachios, a sprinkle of rose water and a generous drizzle of honey. I would have loved to offer this to Baba and say a heartfelt thank you for the many things he had done for us. I will forever remember his last words to me when he said, "work on your heart, a heart has to be polished and chiseled continuously to be able to reflect like a mirror." * Mast-Kiseh: Place a strainer that is lined with a cheese cloth over a deep bowl and pour the yogurt into the lined strainer. Gather the cloth on top and strain the yogurt over night or for at least 6 hours. Refrigerate. 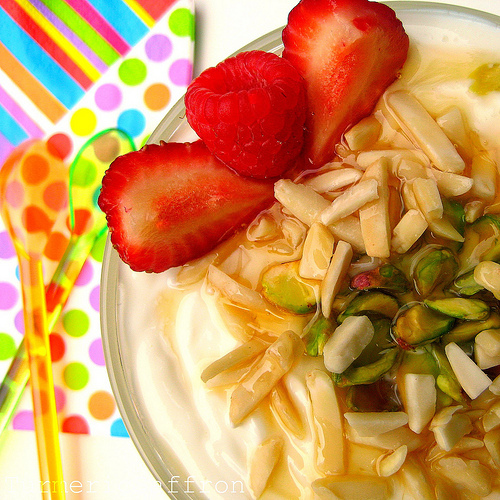 In a bowl combine yogurt, almonds, pistachios and rose water, mix well. 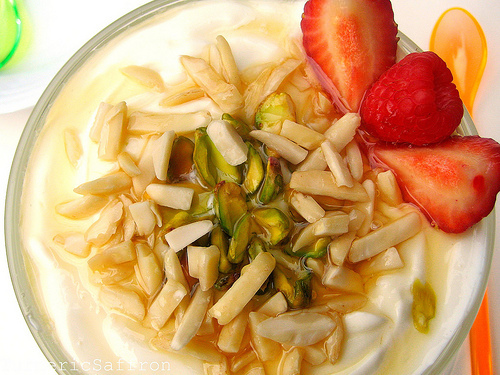 Scoop yogurt into serving bowls, garnish with almonds and pistachios and drizzle some honey. Serve with fresh and seasonal fruits. Recently, a good friend of ours lost his very sweet and dear mother and I offered to make حلوا halva for the memorial gathering which was being held at their house. 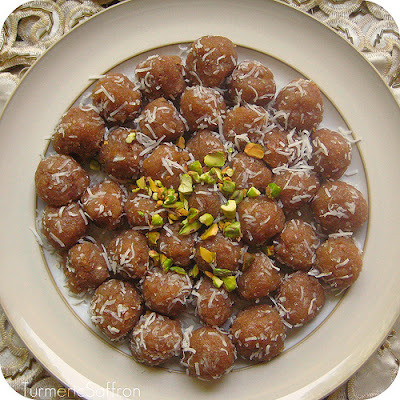 I always make halva when someone that I care about passes away. This must be one of the things I've picked up from my mother and have learned growing up in a rather traditional home where wheat flour halva is considered a symbol of bereavement and "funeral food." In my mind, the taste and the smell of halva is much associated with painful feelings of loss and sometimes unforgettable tragedies. This may be one of the reasons or perhaps the main reason that we don't usually make halva as a regular sweet for our everyday consumption, as much as it tastes good and could easily be categorized as a comfort food. Personally, I find going into the kitchen, taking a heavy bottomed pan, grabbing a thick wooden spatula, turning on the heat and making warm, soft and sweet halva both therapeutic and somewhat healing. Also, you get to serve it to others who may fondly remember the departed as they take a spoonful of halva and wish their relatives much patience and the deceased an everlasting peace. With just a few ingredients, halva is relatively easy to make. 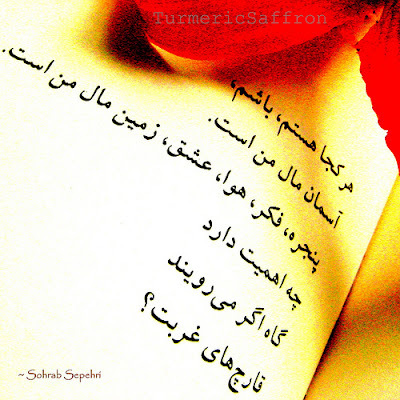 All you need is flour, butter, sugar, some saffron and rose water. It does, however, requires some time, patience and your undivided attention but at the end it is worth all the effort you put in. I've made halva twice since that day, mostly because there was some whole wheat flour left and I didn't want to have the bag sitting in my refrigerator indefinitely. 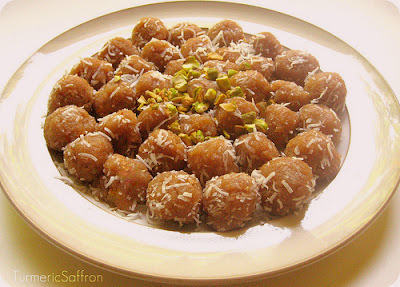 My mother used to make halva with grape syrup but since I couldn't find grape syrup (shireh angoor), I used honey and substituted a cup of vegetable oil for a stick of butter. 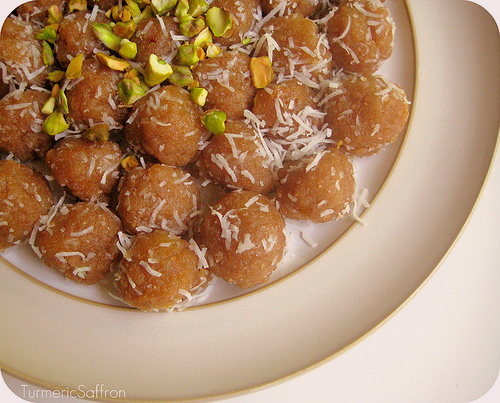 I was so pleased with the results that I'm planning to make halva more often, no occasion necessary! They keep well in the freezer too. I think halva makes a great 4:00 o'clock snack. It can easily replace any junk food snacks. Halva is a fulfilling "real" food and a melt-in-your mouth home-made sweet that is very rich so a small amount will satisfy your hunger and cravings. There are many varieties of halva, some like sweet and buttery halva while others may like it to be just moist enough to go down smoothly and with only a hint of sweet. It all depends on your taste and preferences. I had previously posted a Halva recipe. 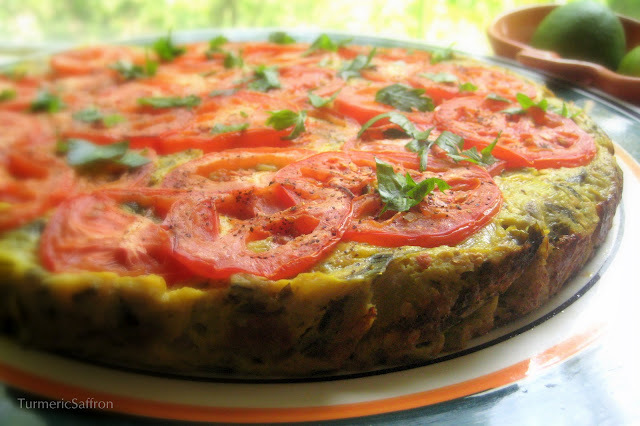 I wonder: what do other cultures and families cook when someone passes away? What kind of food do you serve? 2 cups flour, sifted (I used whole wheat flour), No bleached flour please. 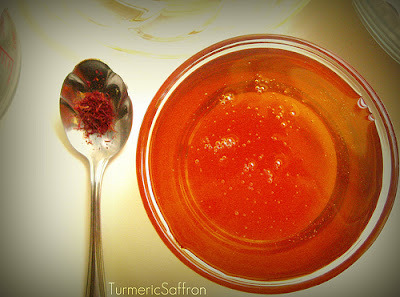 In a small pot bring water to a gentle boil over medium heat, add sugar, honey and saffron. Stir well until sugar and honey are melted and the liquid thickens a little bit. Turn the heat off, you can set it aside or keep it on the stove to keep warm. Place a heavy bottom pan or a non-stick pan on medium heat, add the sifted flour and toast it lightly. You don't want to change it's color but to take away the raw flour taste and smell, continue stirring for 8-10 ten minutes over medium heat until you notice a hint of golden brown on some of the edges of the flour. Add the butter and mix thoroughly. 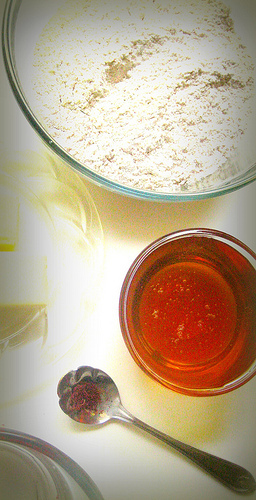 Add the vegetable oil gradually while stirring to prevent the flour from burning. Pour the rose water into the honey-sugar liquid and gently add it to the pot. Mix well, cover and cook on low heat for 10 minutes. Serve on a platter, make it into little balls, try them sandwiched between wafers or serve them with lavash. easy yet scrumptious dinner with ingredients you already have in your pantry and refrigerator. In a time like this, eggplants come in handy. They are so versatile. You can fry, grill, roast and pickle.They come through when you need them and never disappoint. The great thing about کوکو بادمجان eggplant kookoo, besides its wonderful taste, is that it doesn't absorb a ton of oil. Grilled eggplant kookoo with leeks and sliced tomatoes as toppings is the sixth kookoo/kuku recipe that I'm posting so I suppose it is obvious by now that I am a big fan of kookoo. 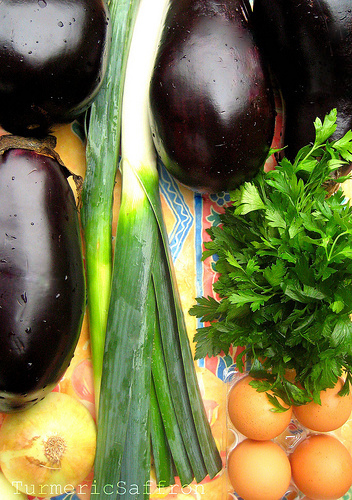 Pierce the eggplants with a fork or a sharp knife in several places. Preheat oven to 375 degrees Fahrenheit and bake the eggplants for 30-40 minutes. Remove from heat and place in the colander to let the eggplant's bitter liquid out. Once the eggplants are cooled, separate the skin and chop them and set aside. Heat oil in a skillet over medium heat and saute the onions until golden brown. Add turmeric, stir, add garlic, saute for 2-3 more minutes and add the sliced leeks. Saute for an additional 5 more minutes or until the leeks are soft and tender. Sprinkle a dash of salt and add the walnuts and the chopped parsley. Give it a good stir and set aside. 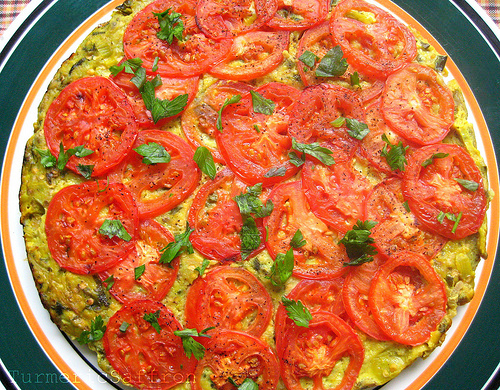 In a large mixing bowl, combine the eggplants, leek and parsley mixture, egg, red pepper, flour and salt. Mix thoroughly. Lightly grease the bottom of the baking pan. Pour in the mixture and flatten the surface. Garnish with sliced tomatoes and sprinkle them with salt and pepper to taste. Cover with aluminum foil and cook in the 350 degrees Fahrenheit preheated oven for 45-50 minutes. Remove the foil for the last 20 minutes of cooking. You may put the kookoo under the broiler for an additional 4-5 minutes or slightly longer to roast the top until it is well-cooked. Serve on a platter, warm or cold, with warm bread and yogurt. 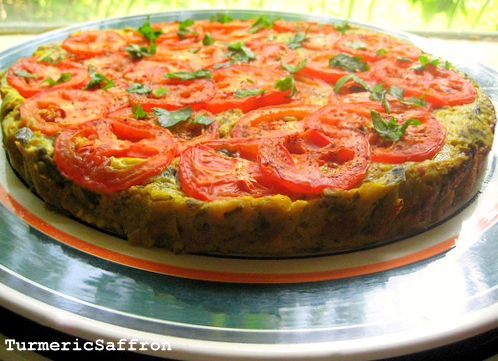 Serve them as a tasty side or a splendid main dish. The sky is always mine. the mushrooms of nostalgia grow? 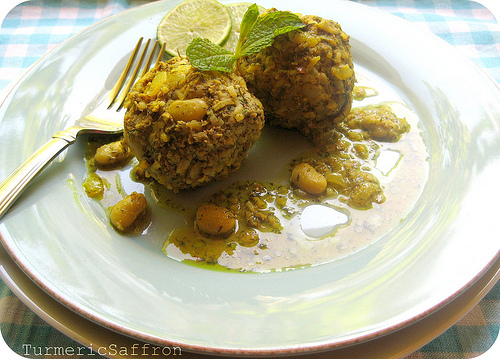 کوفته شوید باقالی koofteh shevid baghali is made with ground meat, rice, baby Lima beans and fresh dill, made into a ball with tasty fillings in the center for that additional burst of nutty and sweet flavor. This delicious one-dish meal is worth every bit of effort and time that goes into preparing it. To me, some meals are works of art that you can't help but marvel at and appreciate the ingenuity that brought about its creation. This koofteh happens to be one of them. As I rinse the rice, pick apart the feathery dill tips, steam the beans and put the dinner together, I am filled with gratitude and a heartfelt appreciation that I get to make a dish that is as homey as it can get, share it with people that I deeply care about, later put my head down on a pillow in a safe place each night, and send my kids to school in the morning. Isn't this what we all want and every human being deserves? I wish every person a safe home, a loving family, good friends, food on the table, and good health. Place rice in a medium-size pan, add 2 cups of water and a tablespoon of salt, cook for 7-10 minutes on medium heat, drain. Set aside. Cook the beans for 5-7 minutes or until soften on medium heat with 2 cups of water and a dash of salt. Drain and set aside. In a large mixing bowl combine rice, meat, lima beans, dill, eggs, flour, a grated onion, minced garlic cloves, 1/2 teaspoon of turmeric, salt and pepper. Mix thoroughly yet gently. Take about 1/3 of a cup of the mixture and shape into a ball. Place about 1/2 teaspoon of the filling of your choice in the middle and close. Set aside. heat 3 tablespoons oil in the meantime, in a wide heavy-bottomed pot, saute sliced onions over medium heat until transparent. 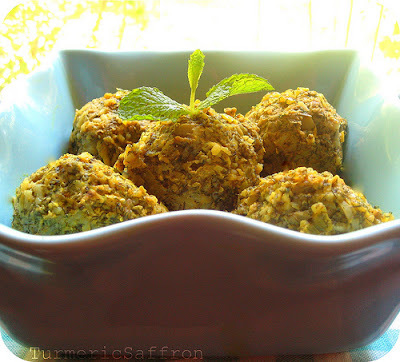 Add 1/3 teaspoon turmeric, 3-4 cups of water, bring to a gentle boil and place the kooftehs in the pot one by one. Add more water if needed. Bring to a boil, reduce heat and cook for an hour on medium to low heat. You can also bake this in a 350 degrees preheated oven for an hour. 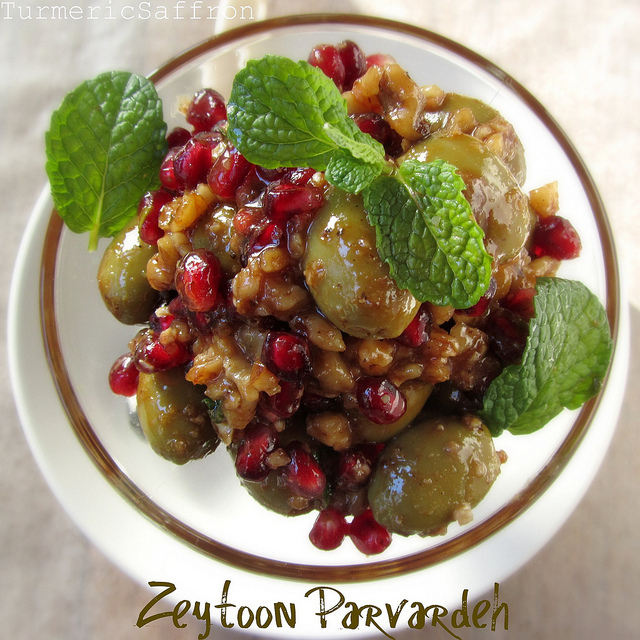 Serve warm with yogurt, salad or pickles and warm lavash or pita bread. 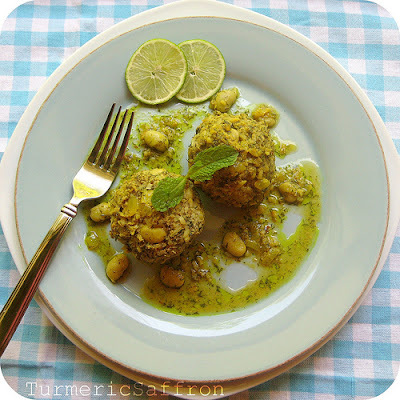 I posted my favorite recipe for Herbed Koofteh a while back, please check it out if you're interested.